It’s now several years since Eduardo Chadwick of Viña Errázuriz in Chile organised a tasting in Berlin, modelled on the ‘Judgement of Paris’, Steven Spurrier’s 1976 tasting were some of France’s best châteaux were defeated by Californian wines in a blind tasting. Chadwick’s version pitted his own top wines against the likes of Châteaux Lafite and Latour in a head-to-head challenge which inevitably was tagged ‘The Judgement of Berlin’. 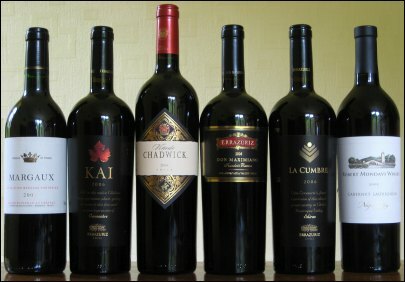 Thirty expert judges tasted and ranked the 12 wines blind, and when the scores were totted up, two of Chadwick’s wines – Vinedo Chadwick and Seña – had taken the top two spots. The event was so successful for Eduardo Chadwick, and generated so many column inches, that he has since repeated similar tastings around the world, most recently in London in May. Unfortunately I could not attend the tasting (where the Chadwick wines were pipped by Margaux 2005, Lafite 2005 and Solaia 2005) but Eduardo generously sent me a set of his top wines so that I could taste them at my leisure. These were the Don Maxiamo 2006 (£29.99 – see all stockists on wine-searcher), the Kai 2006 (£29.99 – see all stockists on wine-searcher) and the Vinedo Chadwick 2006 (£45.00 – see all stockists on wine-searcher), all Bordeaux-esque blends of one configuration or another. Also included was La Cumbre 2006, Chadwick’s top Shiraz wine (£29.99 – see all stockists on wine-searcher). Rather than simply open and taste these, I decided to spice things up a little by holding my own little blind tasting challenge with the four wines plus a few ‘ringers’ (Sadly, the consignment from Señor Chadwick did not include a set of first growths too!). Into the mix I slipped the 2005 Robert Mondavi Napa Valley Cabernet (Around £22.00 – see all stockists on wine-searcher) which was a perfect shadow for the all-Cabernet Viñedos Chadwick, the 2005 Margaux from FromVineyardsDirect.com, a blend similar to the Don Maxiamo (in fact, this is declassified wine from Château Palmer at £18.45). To compete with La Cumbre Shiraz I included Patrick Lesec’s Gigondas Cuvée Romaines 2005 from Waitrose at £15 and which The Wine Gang awarded 93-points for the 2006. The wines were poured (not by me) into identical ISO glasses which had been ‘secretly’ numbered with a little sticker beneath the foot and presented to me in a randomised line-up. I then tasted each wine in turn, writing a tasting note for it (which appears exactly as written below) and compared them with each other, eventually ranking the seven wines from 1 to 7 in terms not just of my perception of their quality, but on the enjoyment I got from them. Who knows, perhaps this ‘Judgement of Glasgow’ will go down in history too!